The tables below show the combat missions that the 458th Bombardment Group flew between February 1944 and April 1945. The two diversion missions in February 1944 were in support of the Eighth Air Force's "Big Week" and were the final practice missions for the group before beginning combat missions. The Trolley Missions in May 1945 consisted of five air crew and ten passengers (ground personnel) per B-24. The passengers were given an aerial tour of the targets that the 458th had bombed to show their contribution to the victory in Europe. These "missions" were set up like the actual combat missions as far as briefings, routes, etc. The 753rd Squadron was chosen to participate in the AZON Project during the months of May-September 1944. During May and June, 753rd crews underwent training and flew only AZON missions; participating in no regular combat missions with the rest of the group. 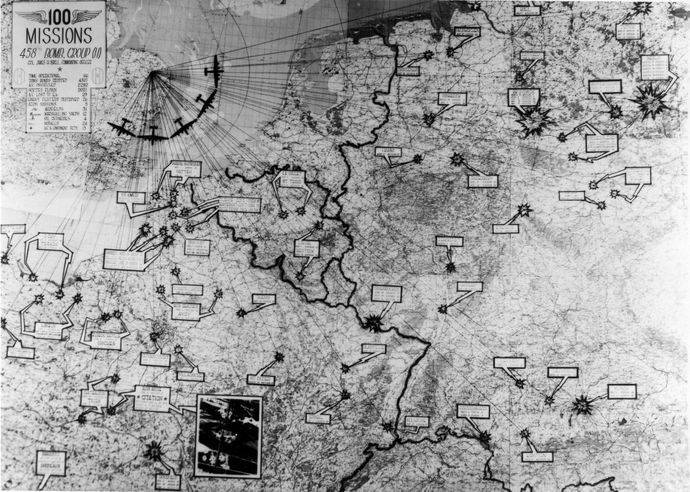 In all, ten AZON missions were flown, and a further six missions were briefed but later scrubbed or abandoned. These ten missions were counted in the 458th's total credited missions, bringing the final total up to 240. AZON missions are highlighted in GREEN below. In September 1944, due to slow supply lines and a fast moving army, most of the 2nd Bombardment Division was tasked with ferrying gasoline, food and other supplies to Patton's Third Army in France. These supply missions were dubbed "Truckin' Missions". B-24s from the group, and other war-weary Liberators on loan from other bomb groups were loaded with specially-fitted tanks in bomb bays and fuselage and flown to airfields in France where the gasoline was unloaded and trucked to the front. Flight crews consisted of a pilot, co-pilot, navigator, engineer, radio operator and one gunner. Many off-duty personnel, flying and ground men, took the opportunity of the one-day flights and hitched a ride to the Continent. These missions were not without danger, as the airfields were newly liberated and many still had bomb-damaged runways that proved hazardous to the group's B-24s. Four planes flown by 458th crews sustained damaged on these runways and were salvaged on the Continent. In England, one plane crashed on take off killing the entire crew. One civilian was killed and five civilians had minor injuries. One additional loss occurred on the Continent when a B-24 flown by Lt. Koehn took off and strayed too close to German anti-aircraft positions and was shot down over the Dutch Coast. Only one man bailed out and was taken POW. These "Truckin' Missions" are highlighted below in ORANGE. Missions highlighted in BLUE denote multiple mission days. Those missions in BROWN text are for informational purposes and did not count towards the group's total mission tally. Each date will eventually be a link where additional data can be obtained. I hope to have everything uploaded before too long, so I appreciate your patience. Where possible, 458th records have been uploaded. When 458th records are not available, 2nd Bombardment (Air) Division or Eighth Air Force INTOPS [Intelligence Operations] Summaries have been uploaded. These latter documents have been edited to show mainly 458th involvement in the mission. Formation plans and a more detailed list of pilots/aircraft to have participated on each mission have been included in each file. And, most recently (February 2015), files from the 96th Combat Bombardment Wing (458BG, 466BG, & 467BG) have been donated by J. Peter Horne, a very kind individual from the 467BG Association. Links to the monthly "History" reports for the wing are included below. HUMKE CREW CRASH ON T.O.